Jude Deveraux's bestselling trilogy of Edilean, the small Virginia town where the surprising destinies of three college friends wait to be discovered, continues with this enchanting new novel. After being abruptly jilted, Sophie Kincaid flees to the place her friend Kim Aldredge calls heaven on earth. But Sophie's first taste of Edilean is far from heavenly: after her car breaks down on a country road, she is nearly run over by a speeding sports car. A small act of revenge brings some satisfaction, and word quickly spreads that a gorgeous newcomer gave the driver, the notoriously bitter Dr. Reede Aldredge, a dressing down! But it isn't the first time the fiery artist has gone too far for payback; a secret possession she carries with her could shatter her ex-boyfriend's future. Reede Aldredge has secrets, too, including a desire to get closer to the beauty who is turning his dark world upside down. Under the night skies, their masquerade is magic;but will it turn to dust by the light of day? I have really enjoyed the Edilean books. I've always loved small town's and all the possibilities that can come from that. I love how quaint Edilean is and the mix of people there. It sets the stage for a great story. I prefer to listen to Jude Deveraux books rather than read them. I just love her books on audio. They help me do my chores and the stories are just compelling and enjoyable on audio rather than reading. 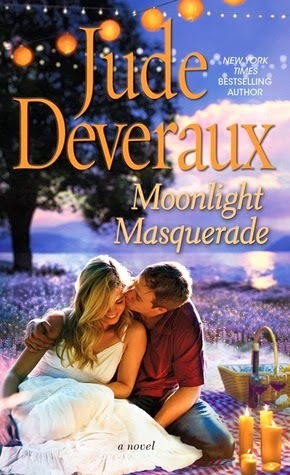 If you are wanting to try some audiobooks I would highly suggest Jude Deveraux. This story is about Kim. She's on the run (sort of) and needs a job and a place to stay. She calls her old college roommates and heads there. She's sacrificed so much in her life for her little sister and now it is time to think about her for once. Edilean takes her in. Kim and the local Dr have a little something going on yet the Dr needs to keep his real identity a secret. The whole town is in on it. Which makes for some pretty fun situations. There is also some mystery, danger and intrigue here. I love how the romance isn't the only thing going on. We have a mystery to solve. Something dangerous is around the corner. It brings another dimension. This book was fun, flirty, and had me rooting for Kim and Reede the whole way. I'm still a huge fan of Jude Dveraux, just more than ever now! I know other reviews aren't impressed with this book but I liked it. I didn't hve any issues with it whatsoever. It was enjoyable and I really wanted even more. I want more Edilean books! I really like Deveroux - Summerhouse is one of my FAVORITE all time reads.